–We have stumbled upon something bigger than life! Breadless BLT’s! 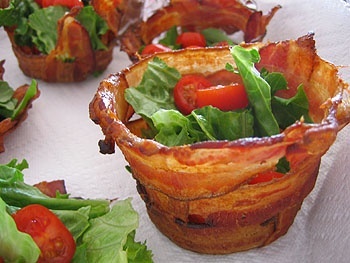 Mold the bacon onto that backs of muffin tins…bake until crisp and fill with arugula and cherry tomatoes and be the STAR of your party, brunch, shower, or whatever:) Bacon=heaven!!!!!! oink.